All of our practice set titles have a wide range of supplements designed to support them. Some of these supplements are specifically for students to improve their learning experience, while others are designed for instructors to lighten their teaching, grading and administrative workloads. This 100 page mini-textbook directly supports Perdisco’s manual practice sets through a focus on teaching the principles essential to preparing, analysing and understanding financial accounting information. It can be packaged with a practice set for only $9.90 and gives students detailed support to independently complete their practice set project. View an overview of the content (116KB PDF). 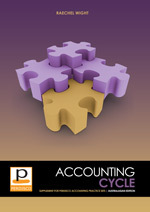 To review the Accounting Cycle Supplement, please order a review copy of the practice set title that you are most interested in and add a comment on the order form that you would also like us to include a copy of the supplement in your review package. Going beyond just asking students to read the instructions, the student companion provides students with information about how the VirtualTutor practice set works. It describes what they will experience when they complete their practice set and provides some helpful hints that will increase their likelihood of success. This companion is based on the experiences of, and feedback from, the thousands of students who have completed our accounting practice sets to date. Taking the time to read and understand the information provided in the companion will enhance each student's overall experience and help them avoid the common mistakes that students make when completing the practice set. The Instructor Companion and Grading Guide to the VirtualTutor practice set provides adopters with information about how the VirtualTutor practice set works. It describes what students will experience when they complete their practice set, and contains a guide as to how our AutoGrade functionality assigns scores. The Instructor Companion and Grading Guide to the free paper format of the practice set provides instructors with a recommended grading approach that discusses each part of the practice set in detail. Based on that approach, a grading sheet with a suggested breakdown of points and a full line-by-line model solution is also provided. In both cases, the Instructor Companion assists adopters and their teaching staff understand how best to integrate the practice set into their teaching and provides guidance that can be passed on to students to help them be successful when completing their practice set. Once adopted, we provide instructors and all of their teaching staff with free access to the practice set, lecture slide packs and course syllabus inclusions to help students access their practice set. And once semester starts, our customer support team will stay in touch - providing ongoing assistance to both adopters and their students.